Offaly U’13 A Shield County Champions !! 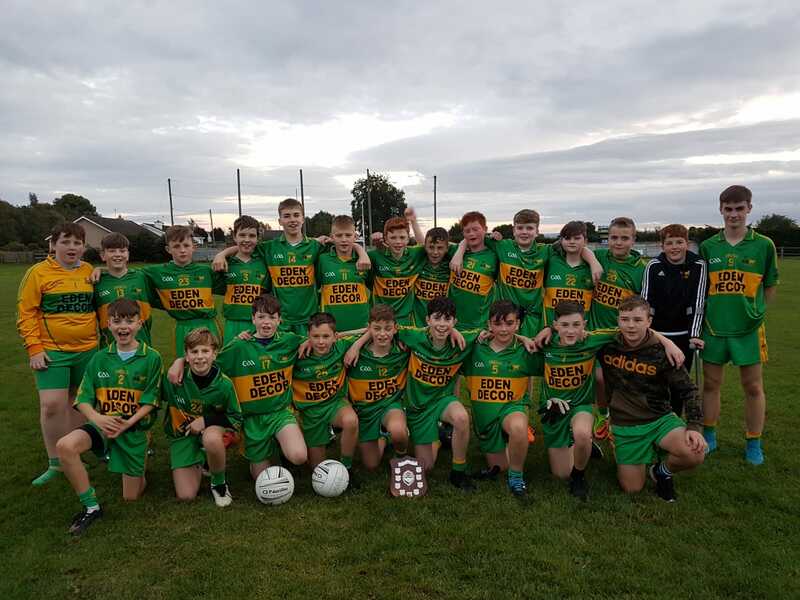 Rhode U13 footballer’s took on Kilcormac-Killoughey in the U13 A shield championship final on Friday evening last in Cappincur where they defeated them on a scoreline of 2-06 to 1-06 to be crowned Offaly U’13 A Shield County Champions of 2018. Rhode led at the break 1-05 to 0-01. Kilcormac-Killoughey came back at them but Rhode Kept plugging away to bring home a championship title to Rhode. The Championship Title win tops off a great year for Rhode U.13 team and management as they won an Offaly league title and a division 2 Leinster league Title. Panel: Joshua Kellaghan, Mark O’Meara, Cameron Egan, Ethan Hannon, Sean Daly, Noah Swaine, Matt Heavey, Evan Farrelly, Ben Kennedy, Ryan Murphy, Ross Kellaghan, Charlie Cullen, Barry Dunne, Tiernan Foy, Gavin Murphy, Cian Cocoman, Liam Walsh, Jamie Glennon, Nathan Glennon, Richie Glennon, Adam Kellaghan, Billy Quinn, Ryan Kellaghan, Ryan Quinn, Cillian Dempsey, Aaron Byrne. Management : Stephen Darby, Seamus Cocoman, Pauric Murphy, Michael Kennedy. Rhode U17 footballers defeated Clara on a scoreline of 1-16 to 2-08 to qualify for the quarter finals. It was a wonderful come back as Rhode were been beaten at half-time on a score-line of 0-07 to 2-06. Team: Tadgh Galvin, Jordan Kilmurray, Rhyse Cleere, Dylan Kilmurray , Evan Rigney, Aaron McBride, Aaron McDermott, Gavin Young, Liam Curley, Luke Spollen, Joe McBride, Shane Murphy, Barry Coffey, Aaron Kellaghan, Harry Jones. Subs Jack Murphy, KIllian Murphy, Jack Kerrigan, Cian Murphy on for Luke Spollen. Thanks also to Bill Glennon for filling in as team secretary for u17 team management on Sunday morning. Rhode take on Tullamore this coming Sunday September 23rd in Geashill at 12 Midday . Rhode U’8 Footballers travelled to NewBridge on Saturday morning last where they took part in Sarsfields GAA club All Ireland football blitz . Our little stars of the future gave a great display of their footballing skills throughout the day and most of all they had a very enjoyable day. 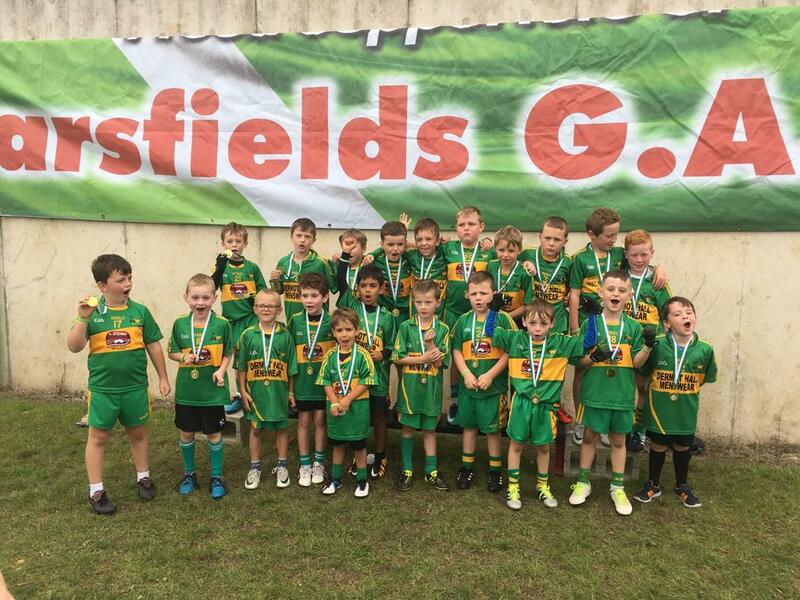 Rhode U,12 footballers travelled to Mullingar to take part in the Sean Dempsey Memorial Tournament jointly hosted by Mullingar Shamrocks and St.Lomans. Our boys had a very successful tournament to reach the shield final but were beaten by BallyBoden St. Enda’s of Dublin. A great day was had by all. Rhode Senior Footballers Take on Tullamore in the Offaly Senior Football Semi Final on Sunday the 30th of September at 4:15pm in Bord Na Mona O’Connor Park Tullamore . Ferbane Play Clara beforehand at 2:30pm . All Wishing to use the new walking track at our grounds have to be members of Rhode GAA Club . If you are not a member then your not insured. Join now to use our wonderful new walking track safe from the hustle and bustle of road traffic . The Track is now fully lit up . There was no winner of the Rhode GAA Lotto Draw that took place on the 10th of September for a Jackpot of €20,000. The numbers drawn were 11 16 19 29. The club would like to thank all those who supported the draw and thanks to Killeen’s for the use of their premises and for their help and cooperation. The following matched three numbers and received €70 each. If you’re not it, you can’t win – Buy 7 tickets – Get 1 free! © 2019 All rights Reserved. Design by Nalcro I.T.